The beginning of our new phase of life begins Tuesday, and what a change it will be! 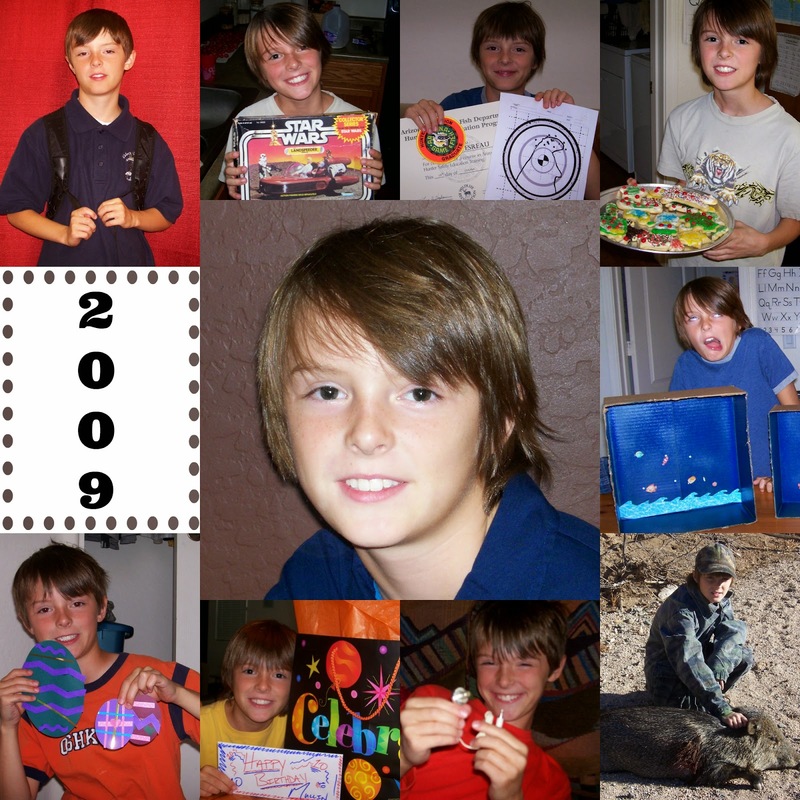 It's been quite the journey to that smile I'm wearing in the above picture. I can't wait to share my journey over the next few days or weeks, depending on how often I can make time to write about it. But, I will say this: I didn't start the journey with that smile on my face. It was more like a frown accompanied by angry eyebrows. But . . . God's ways are not my ways. His ways are best. And I know we'll be blessed! *Prayers are certainly appreciated as our family adjusts to this worthy calling from the Lord. 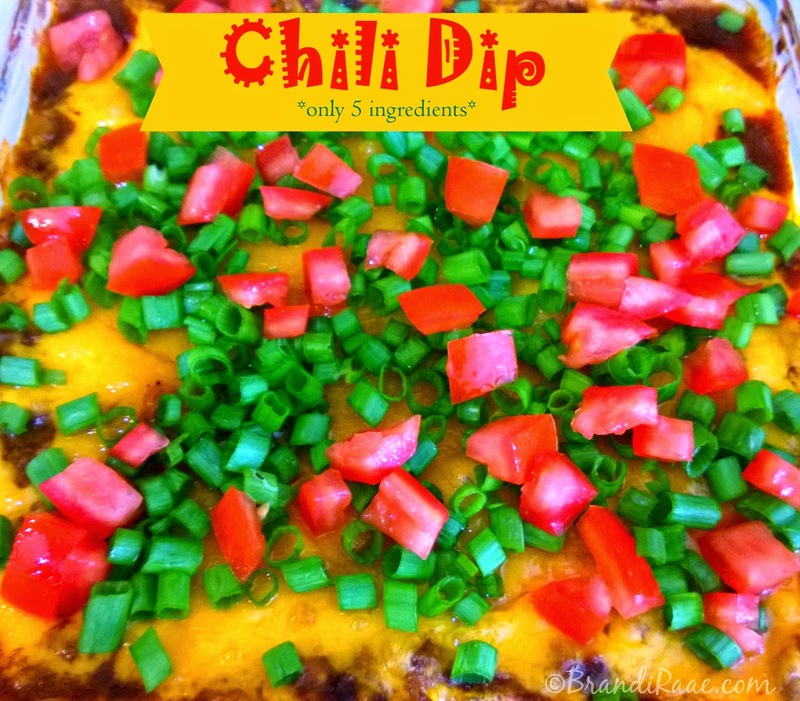 *Fritos Scoops are my favorite chips to use with this dip! Establishing sound reading and language skills is essential for a successful education. 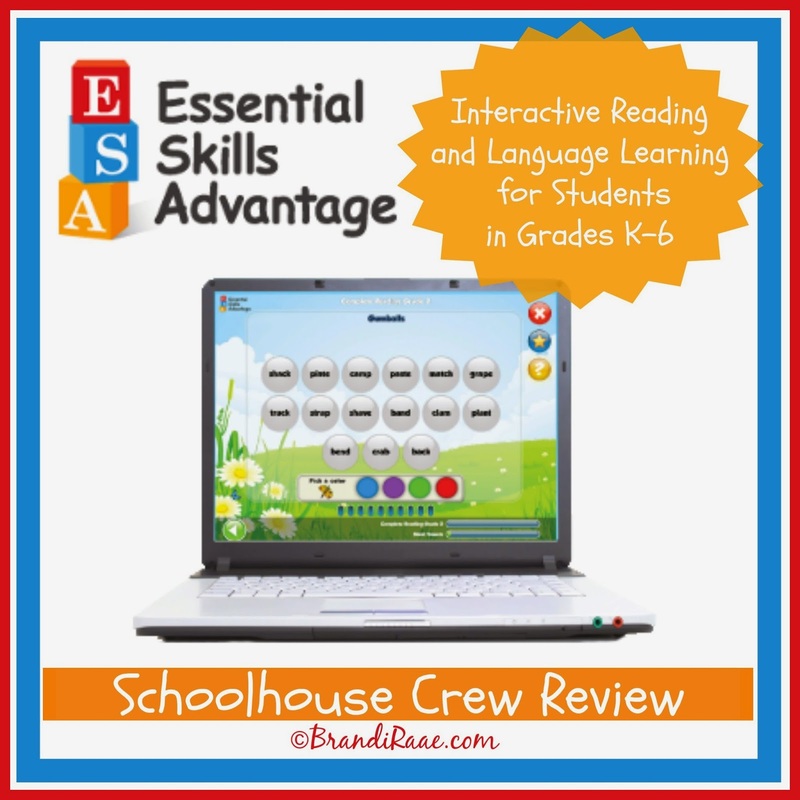 You can help your child gain the necessary skills for success with Essential Skills Advantage (ESA), an interactive, online program that focuses on reading and language. 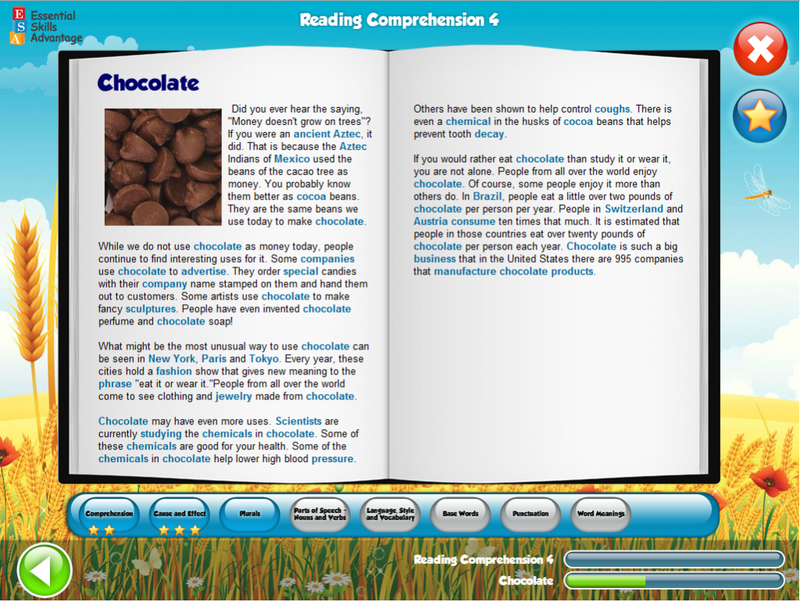 It was developed by a team of experienced teachers in order to help children in grades K-6 become strong readers. My family received a full-year, premium ESA membership to review. The Essential Skills Advantage program offers over 20,000 reading and language activities that use teaching methods that you won't find in a typical classroom setting. 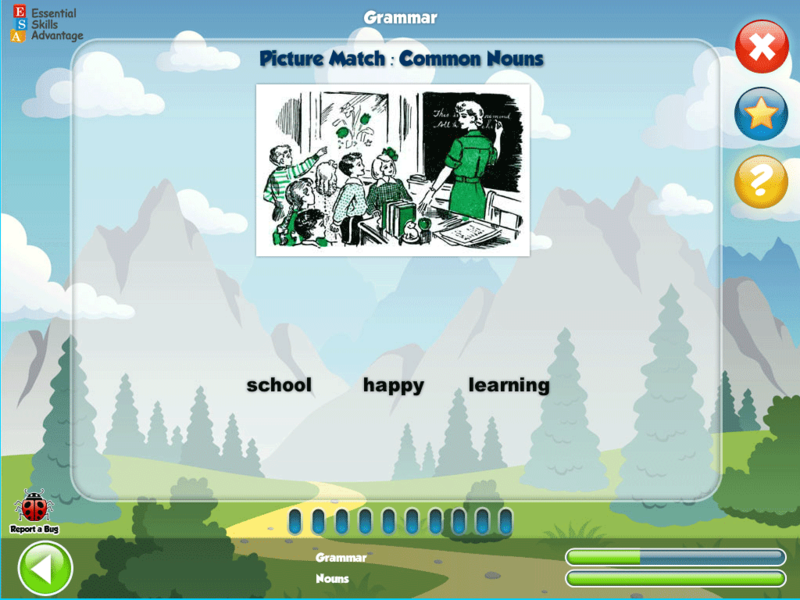 These methods appeal to children with various learning styles plus encouraging messages and rewards motivate children as they learn new concepts through interactive animations. Another great perk is that ESA is simple to navigate, so children can work independently. 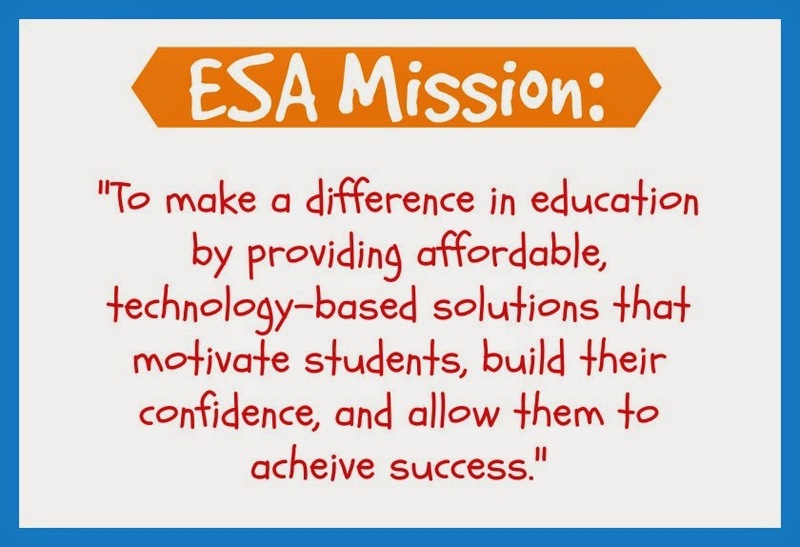 ESA isn't necessarily meant to take the place of any curriculum but to give children what they call "a leading edge" over other students and the ability to "master the education system." For homeschoolers, this program can easily be used right alongside your regular curriculum/methods of teaching. For others, it can be used more like a tutoring system, and ESA has even been shown to help students with certain learning disabilities. All you need to get started is a computer with Internet access. Your computer will need to have Java Script enabled and Flash Player 10 or higher. Children choose their assignments from a menu screen. Because the program teaches skills that build upon each other, activities must be completed in a specific order. This system paces student progress and motivates students to complete the next activity. The 3-starred icons indicate completed activities. Children receive color-coded stars upon completion of activities: 80% and above = gold star and anything below 80% = silver star. At any time, students can access their personal Star Charts in order to see their grades plotted on a graph. They are also encouraged to redo the activities for which they did not earn gold stars. Profile Page: You can also access your profile page here. Parents and children have separate usernames and passwords to log in to the program. Rewards and Resources: You have the option of downloading certificates for your children when they complete units. My 4th grade daughter is the one using this program. She spends about 20-30 minutes each day (Monday-Thursday) working on ESA. 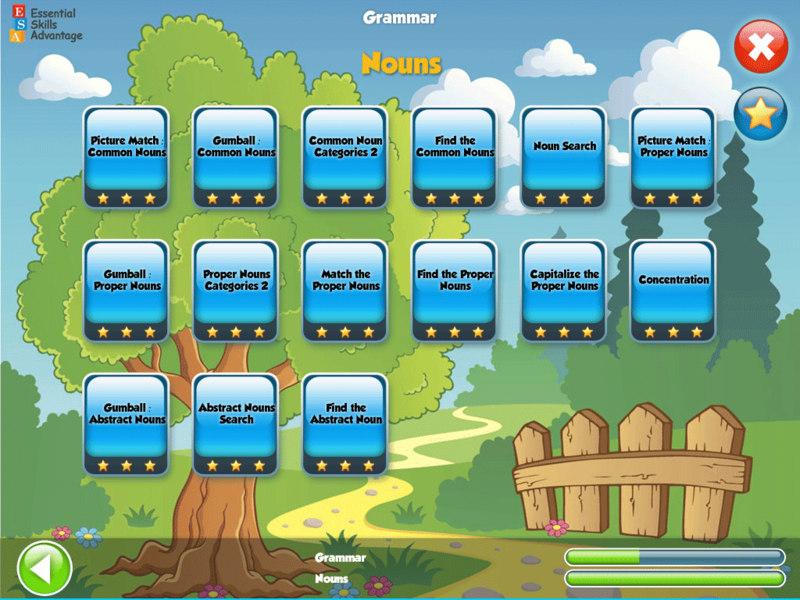 Before logging in, she chooses which subject she wants to do from a menu that looks like the one pictured below. After she picks a subject, she enters her username and password. Each time she wants to switch to a different subject, she has to log in. 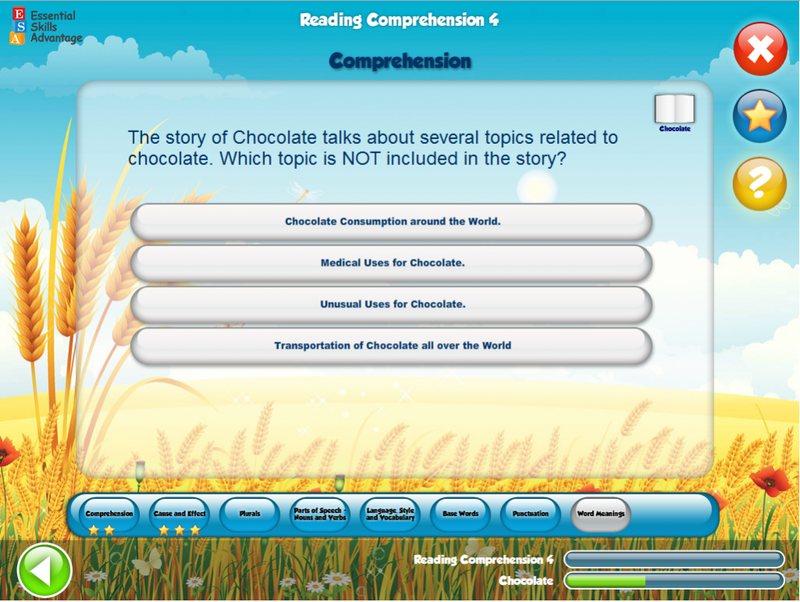 She's been working on Reading Comprehension 4, Vocabulary Builder 4, Spell Master Grade 5, and Grammar Grades 3-5. She tried Spell Master Grade 4 at first, but we both thought it was too easy. For the first week, I sat through the lessons with my daughter to see how the program worked, but she didn't really need my help with anything. While she has to do a lot of reading on her own, there is an automated voice that gives instructions. So far, my daughter has completed the first 5 stories. She did mention the other day that the Dragonflies story contained a brief reference to evolution. In the month that we've been reviewing this program, this is the first time it's come up. 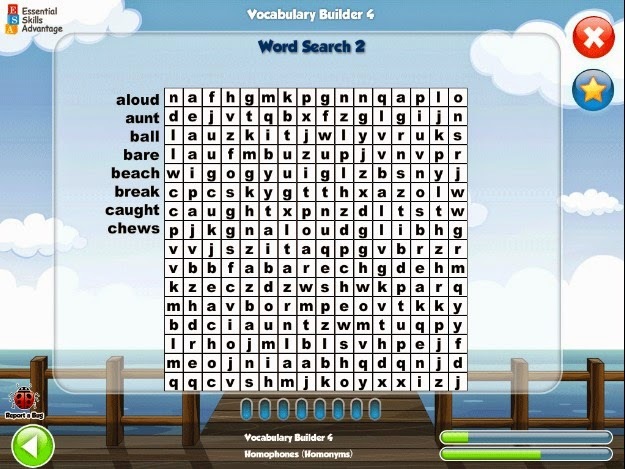 This section contains hundreds of words and activities that cultivate essential vocabulary, language, spelling, and reading skills. 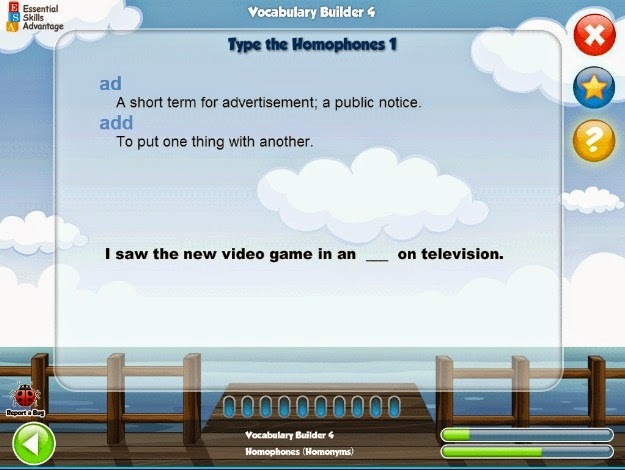 Units cover homonyms, antonyms, synonyms, homographs, compound words, easily confused words, figurative language, prefixes, and suffixes in a gradual and methodical way. 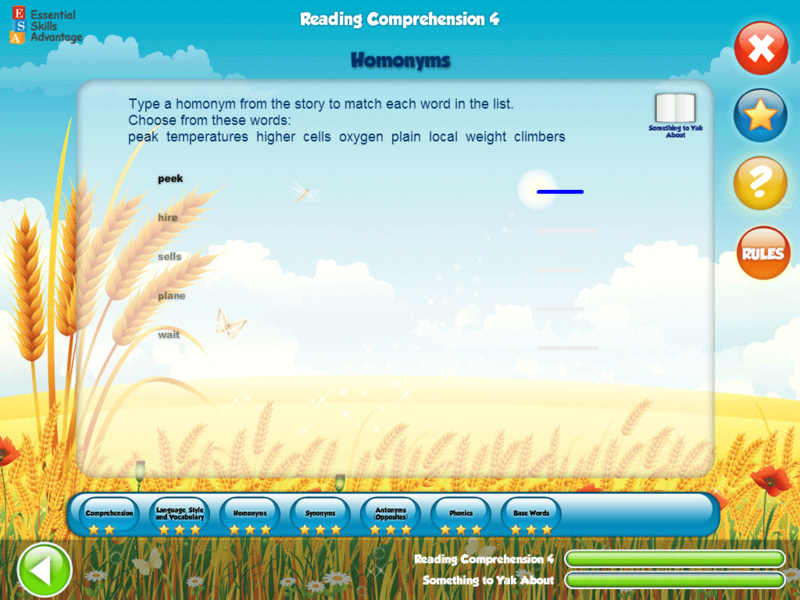 My daughter has completed 21% of the homonym unit so far. 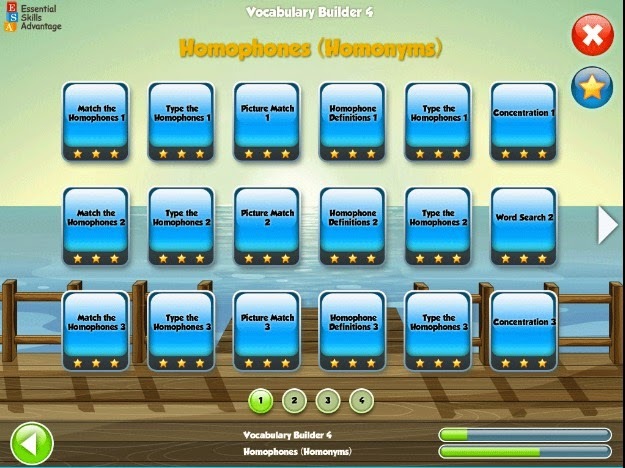 This section contains 38 lists (over 500 words) appropriate for a fifth grade level. 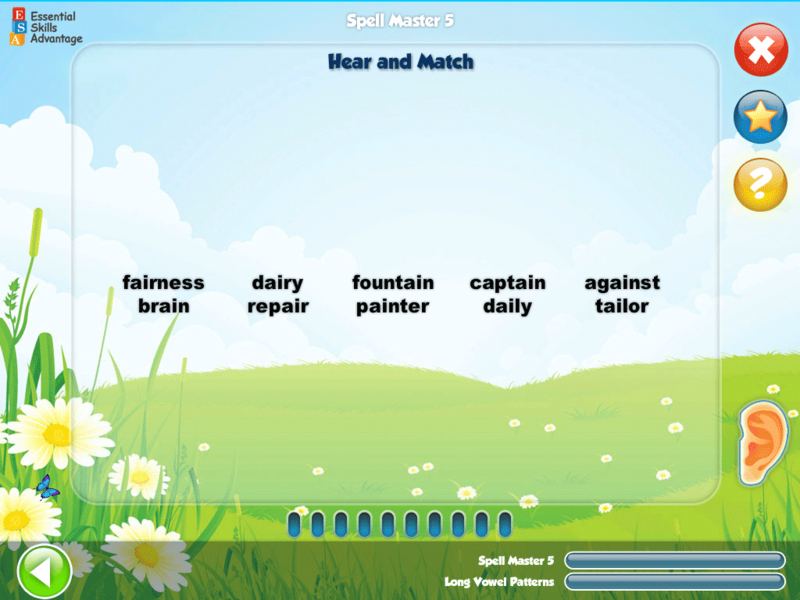 Over 600 activities target certain spelling patterns such as ion, igh, eigh, and ough and cover spelling and definitions of 35 homonym pairs. Like I mentioned before, we switched from the 4th grade level to the 5th grade level in spelling because my daughter thought grade 4 was too easy. Grade 5 isn't extremely challenging for her either, but we're sticking with it for now. My daughter has successfully completed the entire Nouns unit. I see Essential Skills Advantage as a program that is helping my child to become proficient in reading and language basics. It's not a replacement for language and reading, but it's nice to have "someone else" driving home the essentials in a manner that's educational and visually stimulating. 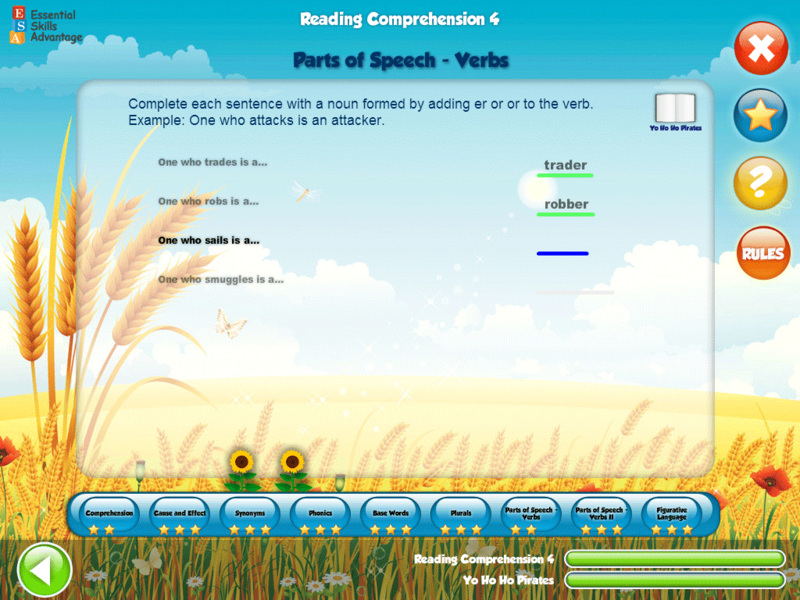 Grammar is not my daughter's favorite subject, so I like that it is stressed not only in Grammar Grades 3-5 but also in Reading Comprehension, and Vocabulary. 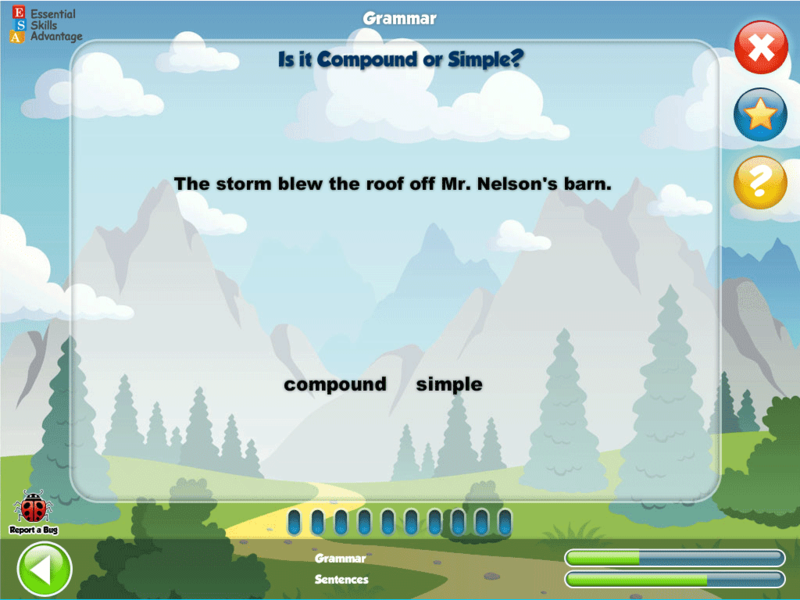 It's good that my daughter can be reminded of basic grammar concepts on a daily basis and can be engaged in a variety of activities that promote independent learning. I like the fact that my daughter can keep track of her own scores and redo activities that she doesn't master right away. I also like that I can go to the Parent Portal to check up on how she's progressing. It seems like most of the time, though, she can't move forward in the program until she gets an answer correct. Other times, she says if she gets an answer wrong at least twice, the program will let her move forward but give a lower score. I'm not against working until you get an answer correct - even I use that method in some subjects, but I just haven't 100% figured out the grading method with this program. Even though my daughter gets a little frustrated about this, it isn't such a big deal that we'd stop using the program over it. When I asked my daughter what she thinks about ESA, she said, "It's okay." I guess that's a pretty typical kid's response to anything related to schoolwork, huh? She also says the program is really easy and that Spelling is her favorite out of all the subjects offered. Essential Skills Advantage is a fine way for my daughter to start her morning bright and early while her brothers are still sleeping and while I'm still getting ready for the day. I'm not a stickler when it comes to making sure my kids are learning the exact same things at the exact same times as other school kids, but it is nice to know that with ESA my daughter is staying current with 4th grade basics. Take a few minutes to browse the website and try out a few sample lessons to see if Essential Skills Advantage is a good fit for your child. If you and your child are happy with the program, you can become a premium member for only $9.99 a month for one student. Premium membership gives you full, unlimited access to all of the ESA programs. The first 14 days are free, and if you decide that the program is not a good fit after all, you can cancel your membership five days prior to the end of your trial period in order to avoid being charged. You do have the freedom to cancel your membership at any time. Become a premium member by signing up for ESA’s Premium Plan at http://buyesa.com/. 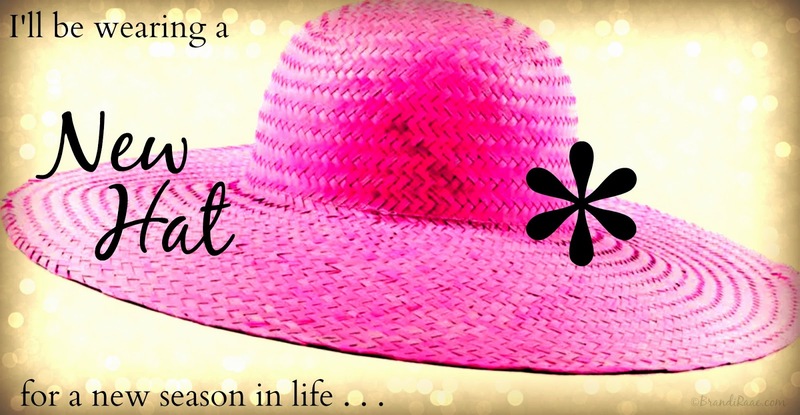 Sign up by October 1st and receive 50% off your monthly premium membership fee! Enter coupon code TOS50 at checkout, and your monthly fee will be reduced to $4.99/month/student. Free Membership Option: ESA is now offering sponsored membership which is absolutely free. You can sign up for free at www.ESAlearning.com. You will have access to all ESA programs, but not all of the features will be available and there will be sponsored advertisements. Be sure to check out what the rest of the Crew had to say about Essential Skills Advantage by clicking the banner below! Both of my boys convinced me that Good Mythical Morning needed to be a part of our morning homeschool routine this year. I figured, Why not? It can actually be quite educational. 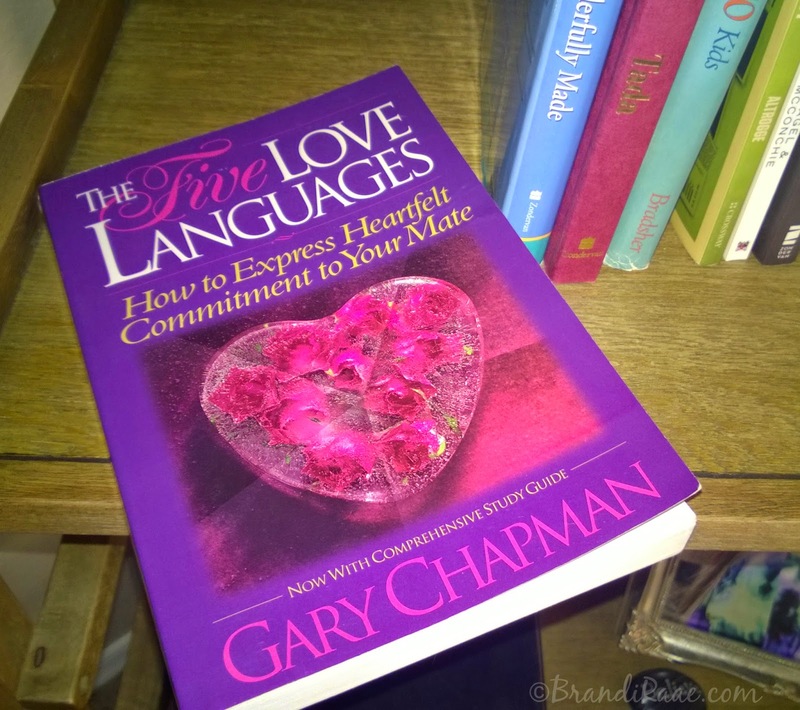 Anyway, the other day Rhett and Link, Good Mythical Morning's hosts, were talking about The Five Love Languages, and it reminded me of the time that seems forever ago that I bought the book and learned what my own main love language was. (And my hubby's, too.) We are still opposites, by the way! Well, there was a link at the end of the morning show to take a love language quiz, so my hubby and I figured we'd take it again just for fun. I predicted what mine would be, and let me just tell ya, they're exactly the same as they were way back when. I guess that phrase, "You can't buy me love" just doesn't ring true with me. ;) I'm kidding. I believe that in a healthy relationship, one should be exercising all of the above ways in which to show love. I mean, if I had a husband who treated me like dirt, never lifted a finger to help, beat me down with his words but then turned around and bought me a gift to make up for the lack of love in other areas, well, that wouldn't fly. I do love gifts, though! My boys even took the quiz, so it was neat seeing what their main love languages were. If you've never even heard of a love language or have never take a quiz, do so. It's fun! And then if you want to know more, buy the book. It goes into much more detail about each love language. 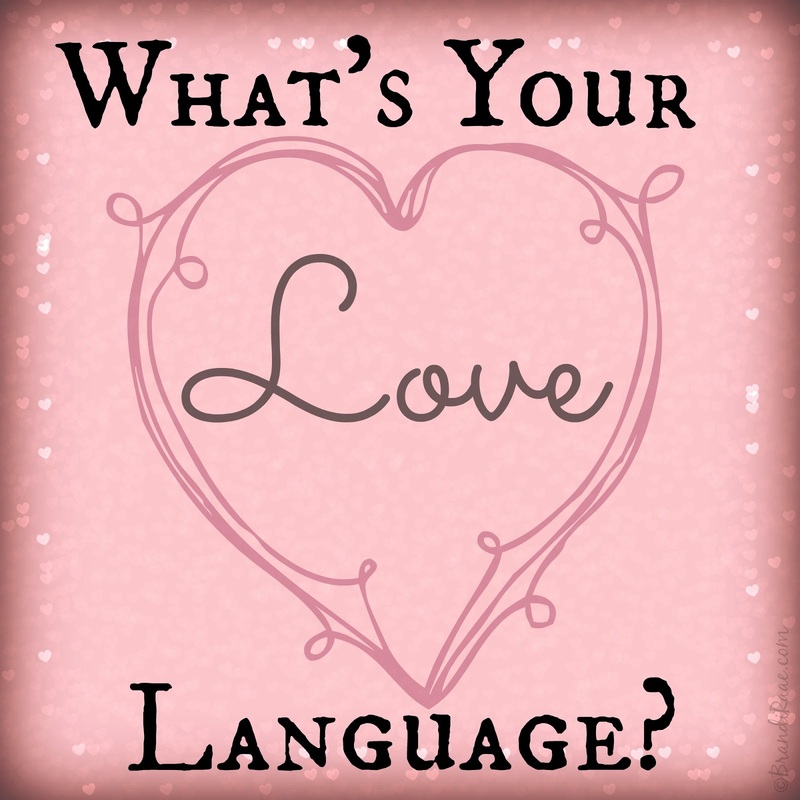 After you take the quiz, let me know what your love language is! 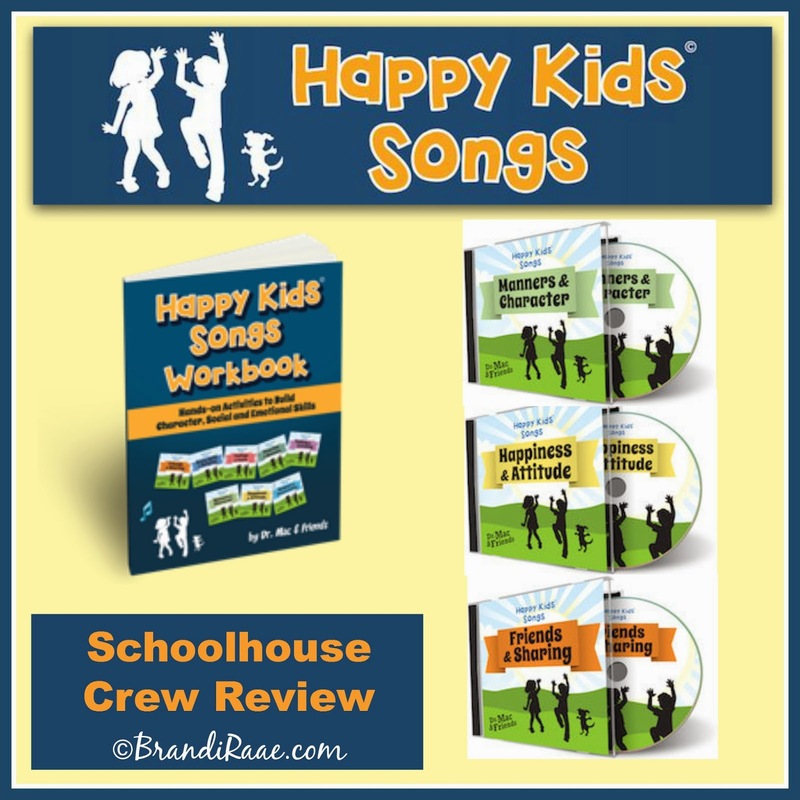 Happy Kids Songs sent members of the Schoolhouse Review Crew three downloadable song sets (15 songs total): Friends & Sharing (Set 1), Happiness & Attitude (Set 5), and Manners & Character (Set 6). Members also received the accompanying Happy Kids Songs Workbook: Hands-on Activities to Build Character, Social & Emotional Skills. If you are looking for quality music with a positive message that can constructively impact your young children, you might want to consider Happy Kids Songs by singer, songwriter, and child psychologist, Dr. Don MacMannis, also known as Dr. Mac. You may already be familiar with some of his work; he's the music director and songwriter for Jay Jay the Jet Plane, a cartoon series on PBS. My oldest son, who is now 15, used to watch it all of the time! With Happy Kids Songs, Dr. Mac, along with his musical partner, Brian Mann, has created eight award-winning, full production albums that are geared toward children ages 3-8. Each album has five songs that provide entertaining music and lyrics which teach children about important character, social, and emotional skills. Songs boast a variety of music styles and instruments and feature both adult and child singers. Some songs are upbeat, and some are a little slower. I wouldn't say the songs sound exactly like what a typical kid is listening to these days, but the music is appropriate for young children, and the singers are pleasant to listen to. Regardless of your taste in music, the albums are professionally done. You can download each album for $4.95 or purchase songs separately for 99¢. We burned our songs to a CD after downloading. As a bonus, you can download lyrics and activity pages that compliment each song. These extras are absolutely free! 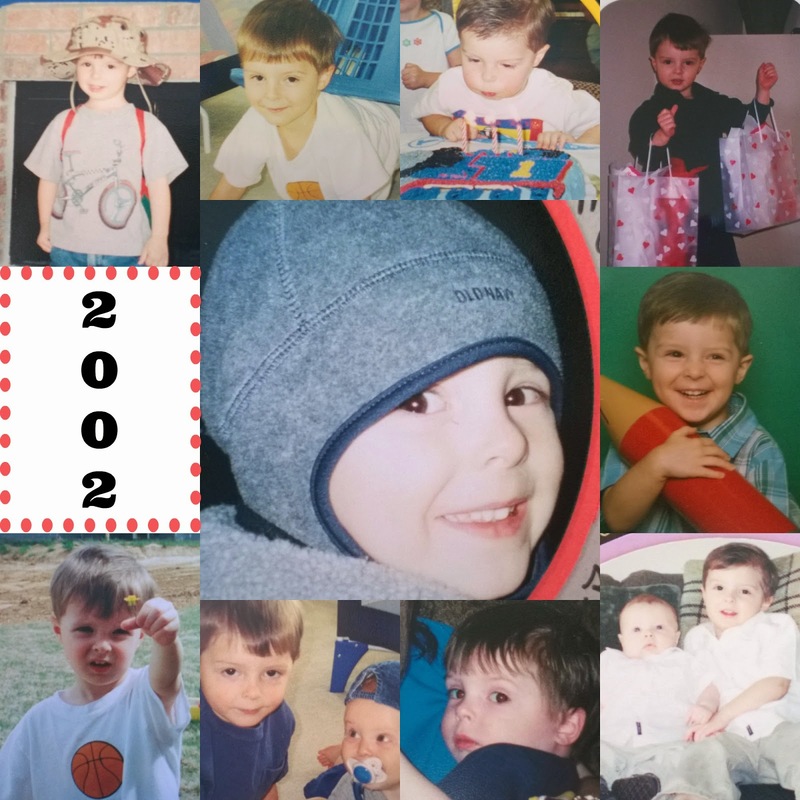 "Sailing on the Seven Cs"
This song is about what it takes to be a good friend: Caring, Consideration, Commitment, Communication, Concern, Curiosity, and Cooperation. Not much blame and lots of sharing. What your friend is all about." "Everybody Wants to Find a Friend"
This song is about reaching out and letting others know you want to be with them. That you want to play with them again." This song is about including others when you're playing. 'Cause sharing friends is the way to go." "Happy as Happy Can Be"
This song is about being happy together. Like friends, like you and me." This song is about saying goodbye but looking forward to being together again. Click the link to listen to samples of Friends and Sharing songs. Below, you can watch a video of the song "Together." "Shake It Out and Dance"
This song is about changing your mindset from I can't to I can. That you've got a way to change, 'I can't' to 'I can.'" "Who Knows What's a Kudo?" This song is about giving compliments and saying thank you. Something nice they do, something nice and new." This song is about asking for an explanation when you don't understand something. But if they can, then why can't I? This song is about seeing the best in everyone including yourself. Then don't forget that everyone means "you" -- you, too,"
This song is about how great it is to spend time with a friend. It's better when there's two." Click the link to listen to samples of Happiness and Attitude songs. This song is about the importance of telling the truth. "If you lie a lot, people will stop trusting you. Even when you tell the truth, they're not gonna believe you." This song is about saying please when asking for things. This song is about understanding that everybody's got quirks. And Grandpa whistles when he works . . ."
This song is about treating others the way you want to be treated. Me and you'll be goin' by that Golden Rule." This song is about recognizing and respecting other people's points of view. Which ones are wrong and Which one's true?" Click the link to listen to samples of Manners and Character songs. I mentioned earlier that there are complimentary activity pages that you can download for free. And there are. However, if you'd rather not deal with the hassle of downloading and printing a ton of pages (workbook has over 120 pages), you can purchase an already assembled workbook for $12.56. The workbook is divided into two sections. 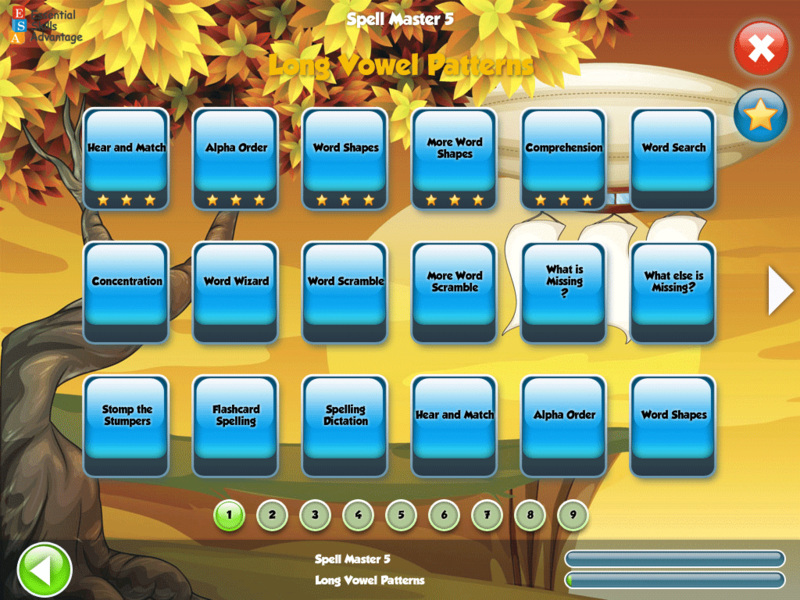 The first provides a lyric page and activity page for each of the 40 songs. These pages include activities such as coloring pages, mazes, word searches, dot-to-dots, drawing, fill-in-the-blanks, and more. The second section has over 80 activity and hands-on project ideas that teachers and parents can do together with their children. Some of the projects do require common, household supplies. 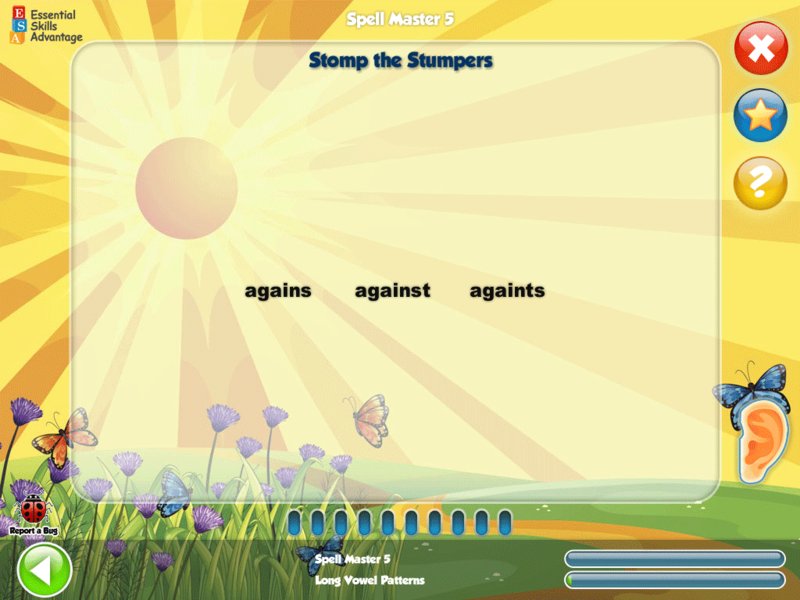 The workbook pages and activities are a great way to reinforce concepts taught in the songs. First off, I want to say that I think Happy Kids Songs is a quality product for young children. 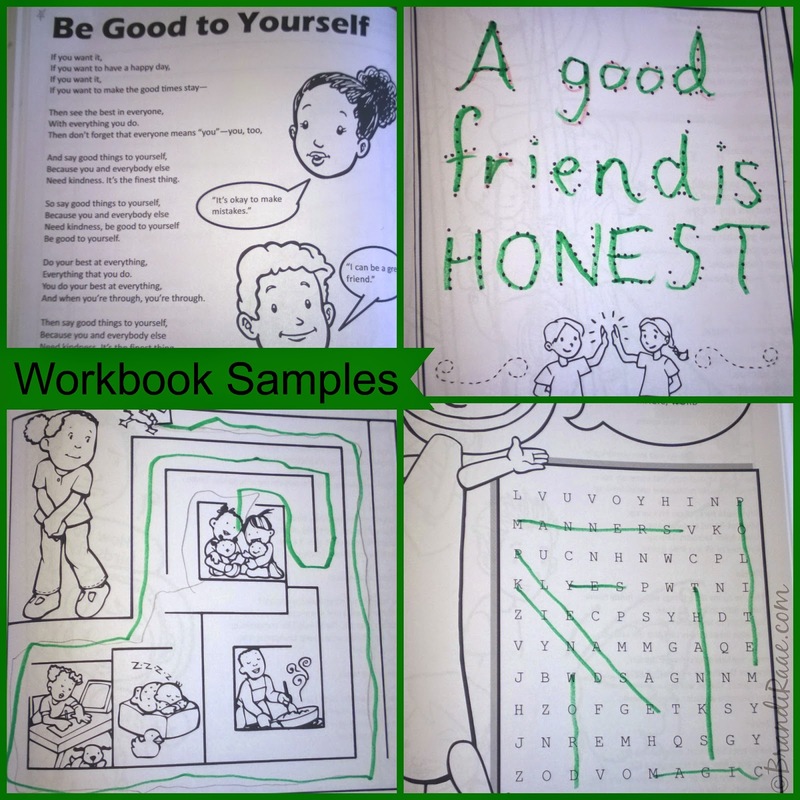 Songs and workbook pages are educational and fun, and they definitely teach character traits that I want my kids to possess. Having said that though, this particular product wasn't a perfect fit for us. It would have been a wonderful compliment to some of the Bible/character materials I used years ago when all of my children were little. My 9-year-old daughter is the only one who listened to the songs, and she feels that she is already too old for the them. It's not the content she feels too old for but the way in which it's presented. Our family mostly listens to "grown up" Christian music, and she says she prefers to listen to our local Christian radio station. I think Happy Kids Songs would be great for families who have mostly young children who could enjoy listening to these songs together. I am sure there are lots of Crew families with little children who reviewed Happy Kids Songs, so click on the banner below to see what they thought. When my family and I traveled to Oregon a few weeks ago, we ate the tastiest salad made by my son's friend's grandma. Her rendition only had strawberries, though. It was so yummy (and I couldn't believe my whole family liked it) that I couldn't wait to come home and make it myself. 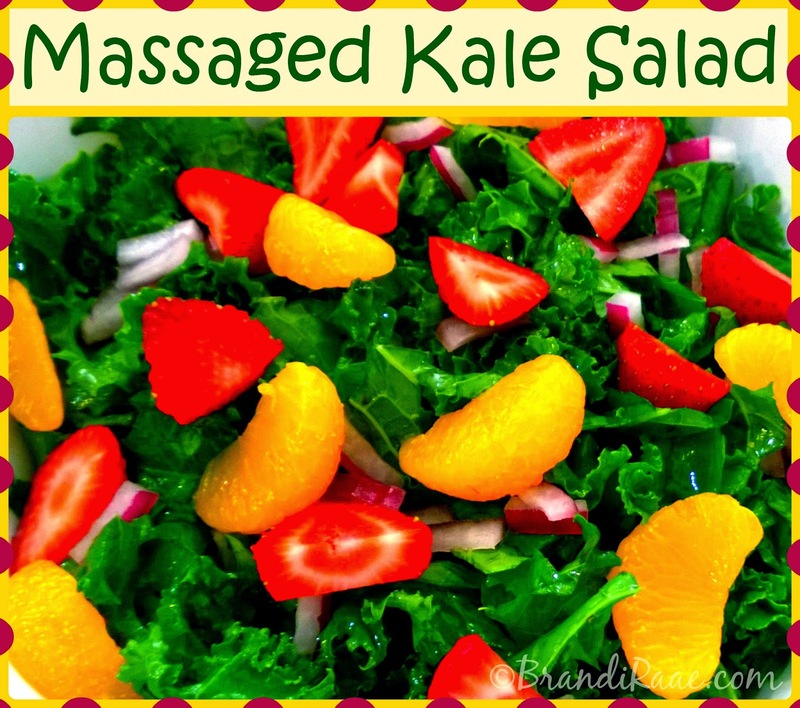 I love beautiful food, and this salad is BEAUTIFUL! 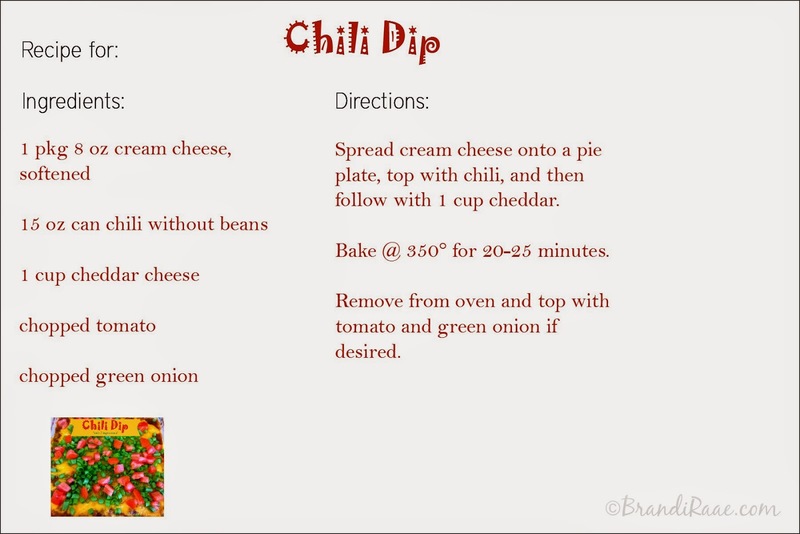 Thanks, Mindy, for sharing your recipe!! Wizzy Gizmo. It's a fun name to say isn't it? I bet you're wondering who or what in the world that is! Well, Wizzy Gizmo is a Who and a What. First of all, he's a genius inventor who loves God and the Bible. He's not exactly a wizard, but he's a wiz when it comes to technology. 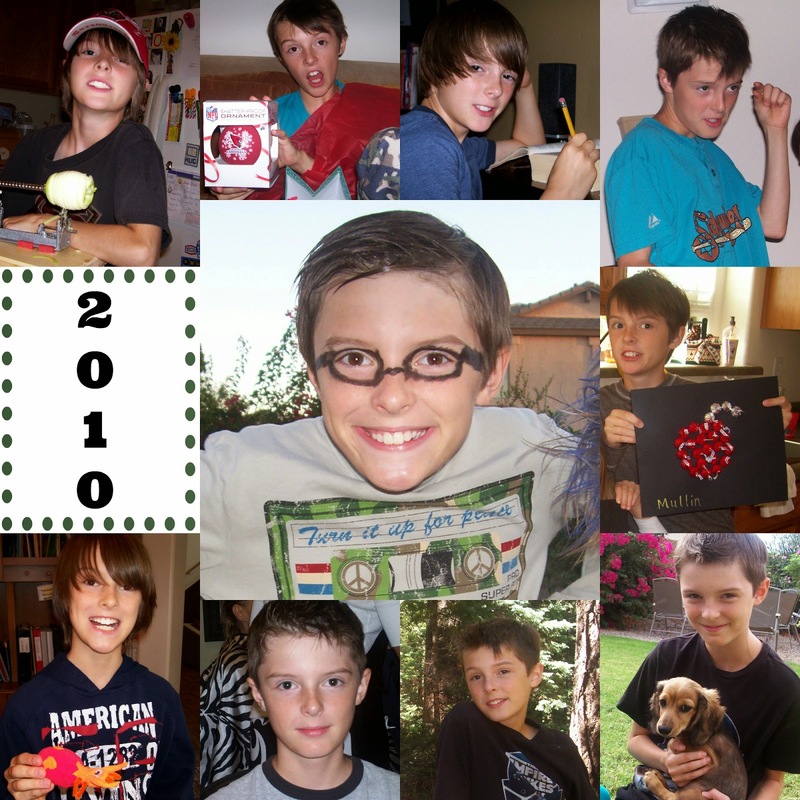 He likes to use his skills to create awesome gizmos. 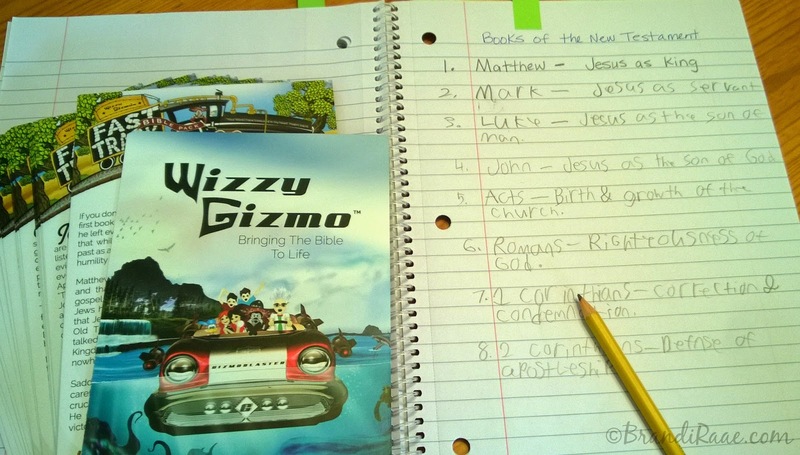 Wizzy Gizmo is also a series of interesting Bible books designed to help kids ages 4-12 explore the Bible through audio dramas, books, and flashcards. 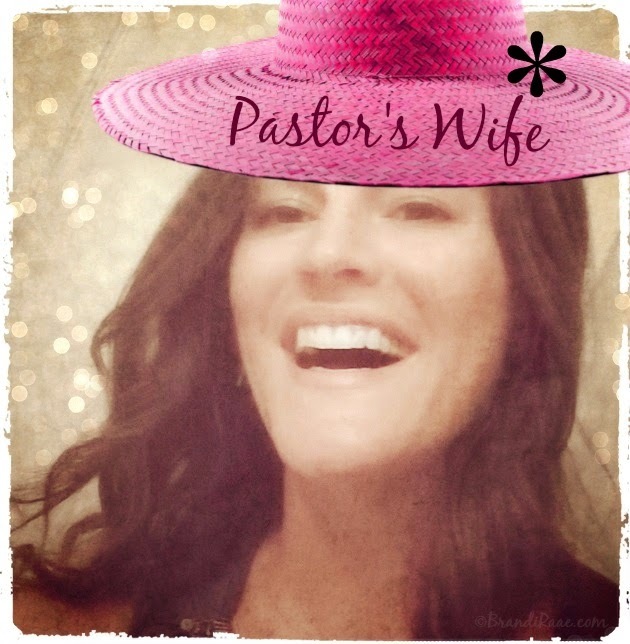 These resources can help parents, Sunday School teachers, etc. to faithfully teach the Bible and carry out the command given to the Israelites in Deuteronomy 6:5-6. The Schoolhouse Review Crew had the privilege of reviewing several of these products. 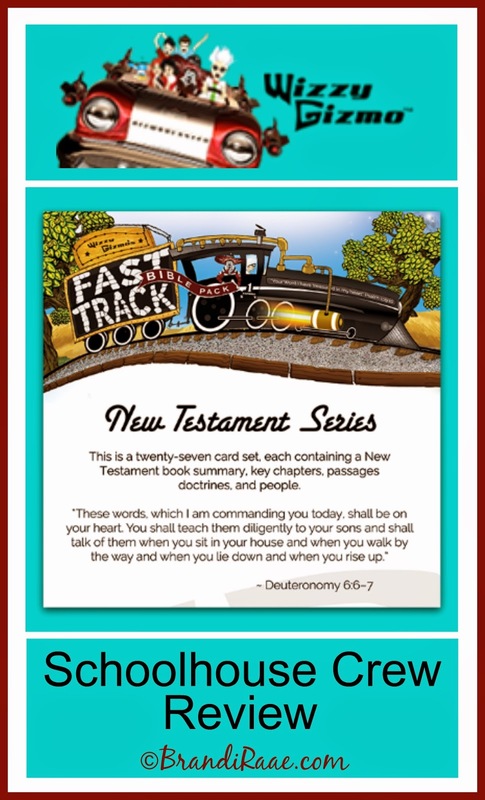 My family received the Fast Track Bible Pack: New Testament flashcards recommended for ages 2 and up. 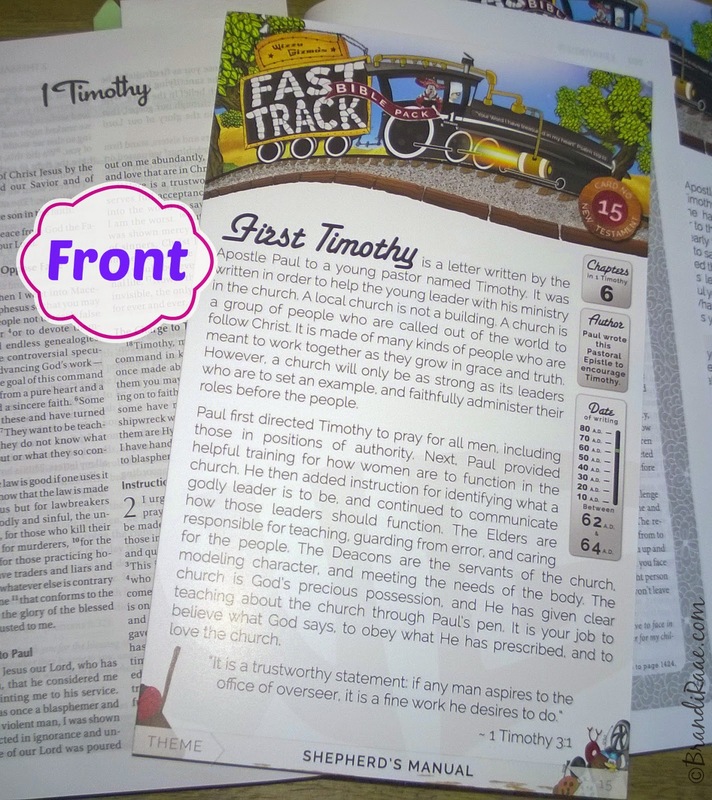 The Fast Track Bible Pack: New Testament flashcards are a great tool for introducing the New Testament books of the Bible to children since the cards include summaries and themes. You can continue to refer to them as you read and study each book since the backs of the cards contain other key information. On the front of each 5x9 flashcard, you'll find a summary of one of the books in the New Testament, a Bible verse, and the theme at the bottom. On the right-hand side of each card, you'll see several important facts beginning with the card number. Below the card number are the number of chapters in the book, a brief statement about the author of the book, and the date in which the book was written. Currently, my children and I are in the middle of reading through the Bible, so we've been using the flashcards each time we begin another book in the New Testament. Before we start, I read the information on the front of the appropriate flashcard. 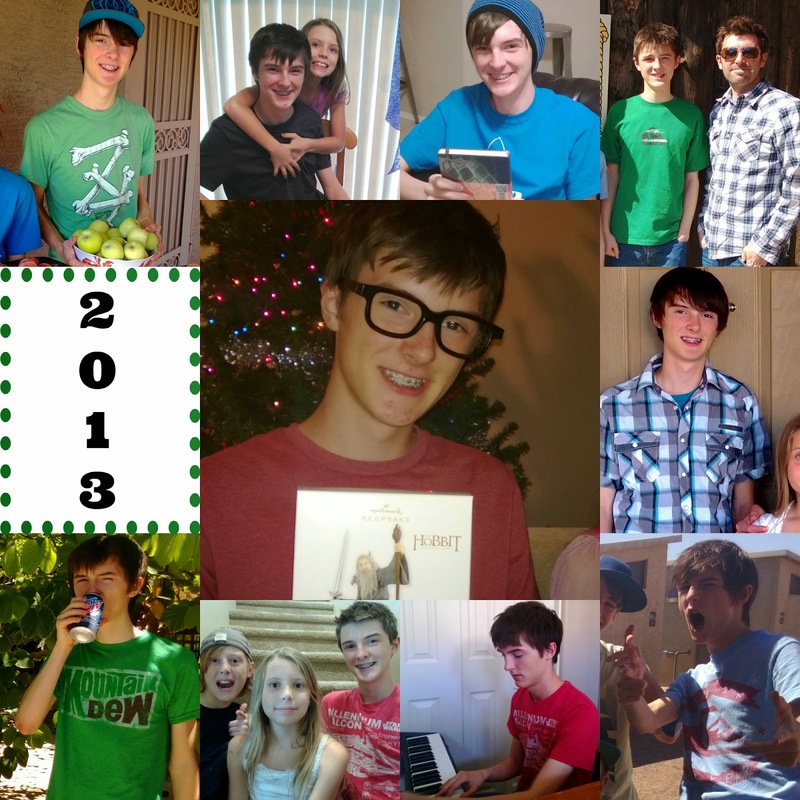 So far we've read the First Timothy, Second Timothy, Titus, Matthew, Mark, Luke, and John flashcards as a family. I haven't really been emphasizing the information on the backs of the cards, except for the Key People section, because our focus has been reading through the Bible this year not intense study. However, for my daughter's memory verses for the next few weeks, we are utilizing the Scripture references relating to forgiveness on the back of the Luke card. My daughter is also using the flashcards to write the names of the New Testament books in order along with their themes. If she couldn't already say the NT books in order without looking, this would be a great way to memorize them. The flashcards are perfect for kids because they're colorful and pack in a lot of important information without going in to too much detail. Plus, they're a great tool for kids to use to dig a little deeper when reading the Bible, especially if the information isn't readily available in a Bible that they own. Knowing what each NT book is about, who wrote it, and why it was written can aid in overall comprehension. If older children want to know more about a certain concept, they can refer to Key Doctrines and study more in-depth. 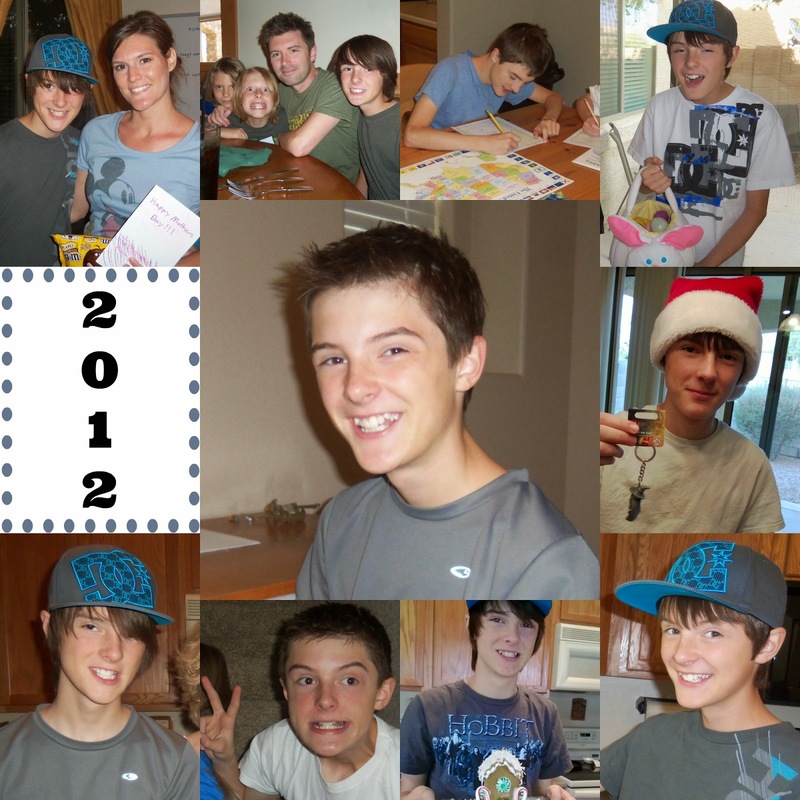 There are lots of suggestions on the website for using the cards with different age groups. I haven't decided how I am going to store the flashcards yet. I thought about keeping them on a key ring, but there really isn't enough room on the cards to punch holes without interfering with words on the backs of the cards. That would bother me. I think it would be handy if the cards came in their own little box or already pre-punched on a key ring. 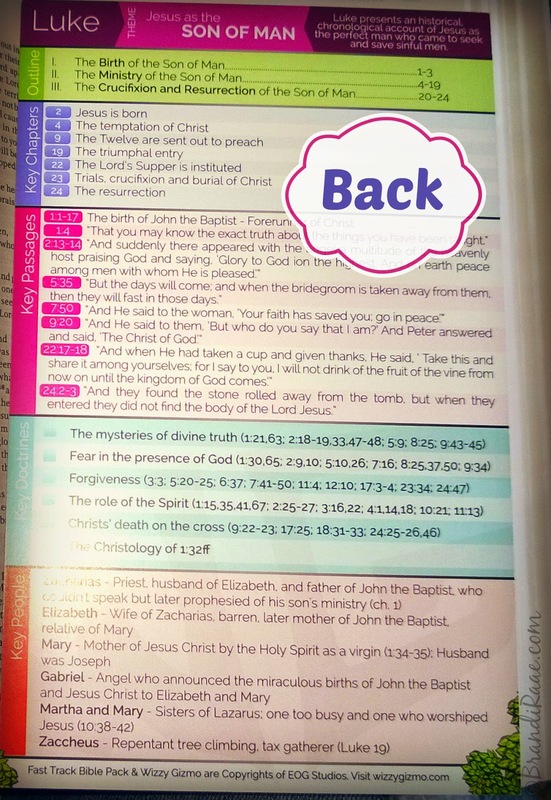 Overall, these New Testament Bible Summary Flashcards are a convenient Bible study tool for kids. They can be purchased for $14.99. Want to save up to 10% off your order? Share Wizzy Gizmo with your friends and earn 2% for each share. Details on the website. To read more about these flashcards and other Wizzy Gizmo products, click the banner below. 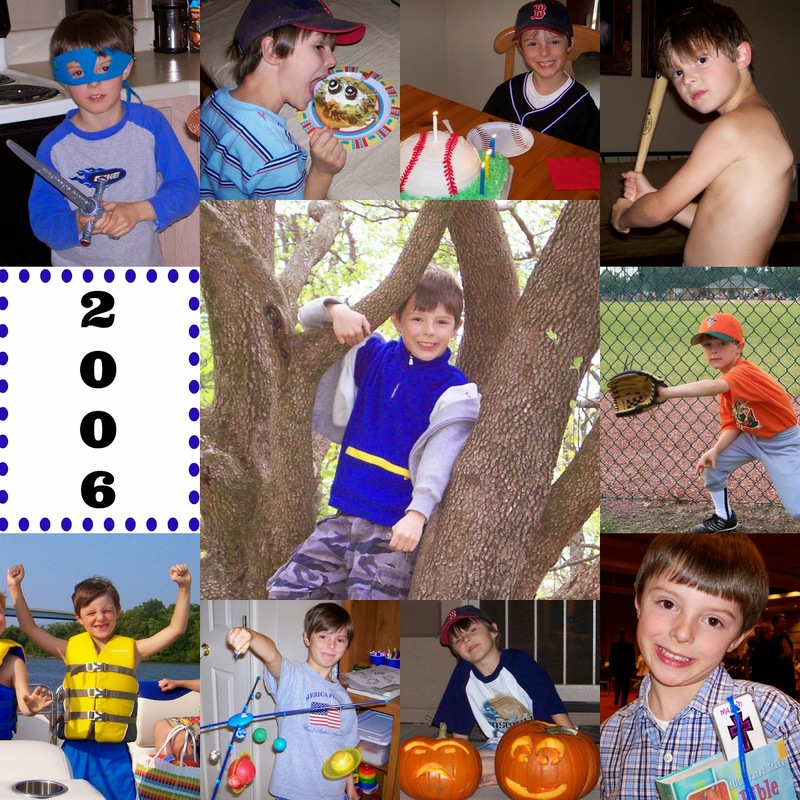 Tuesday was my firstborn's 15th birthday. And every single year I can't help but relive my near death experience. 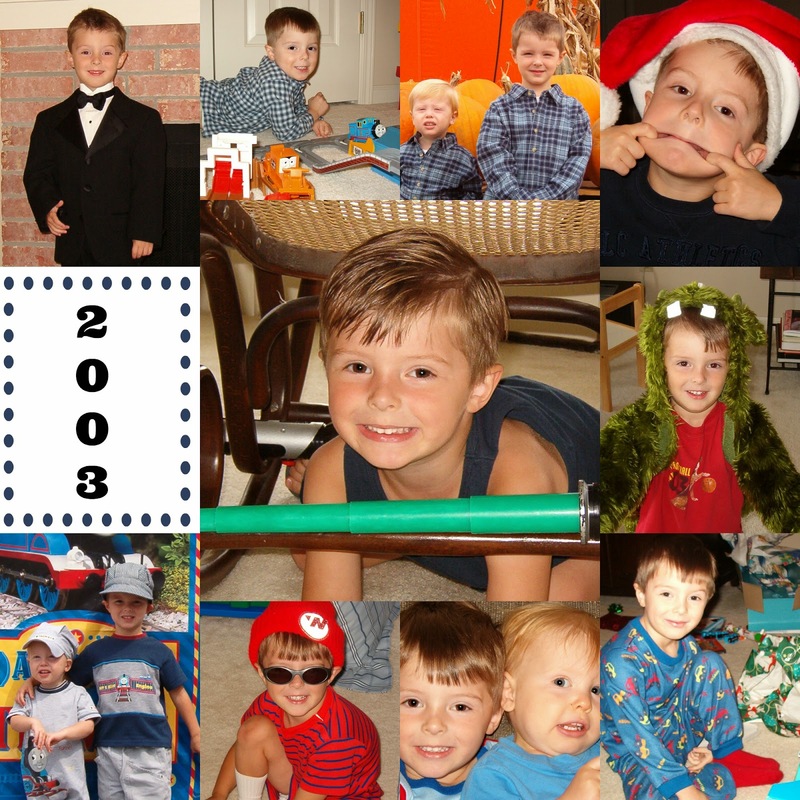 Every year on August 12, I praise God for allowing me to live to raise my son and go on to birth two more babies. 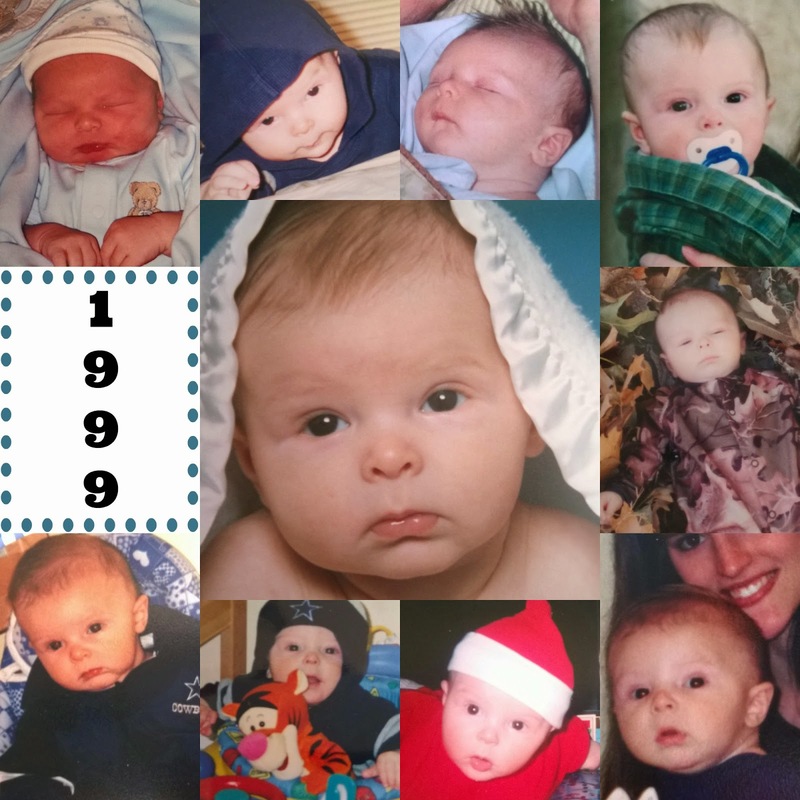 I believe that God has numbered my days and that it obviously wasn't my time to go 15 years ago, but as the paramedics rolled me out the front door that night, my husband truly didn't know if he'd be raising our newborn son alone. 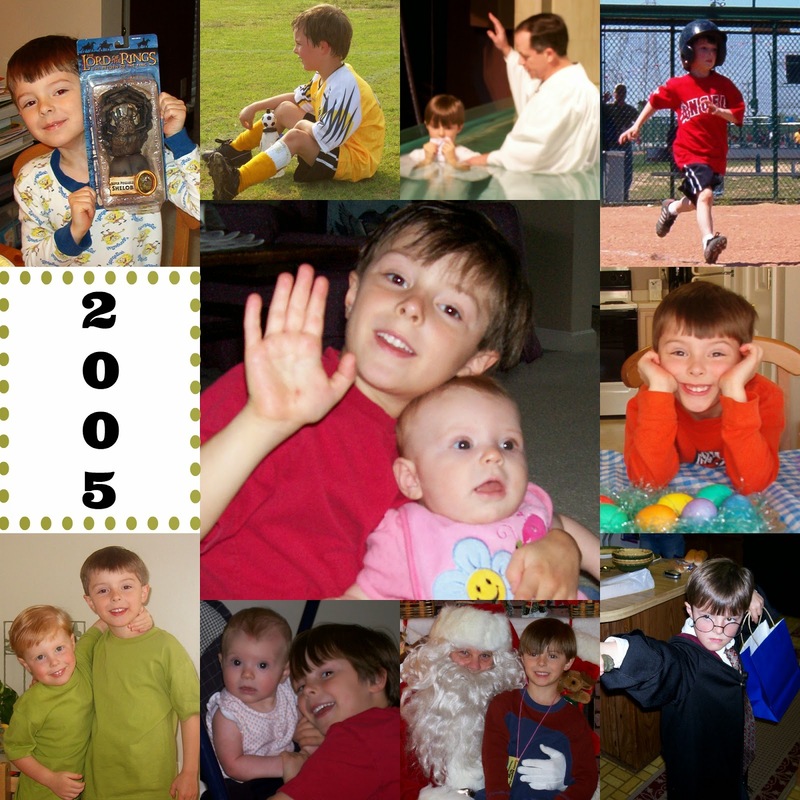 Later, the doctors told my husband that had another hour passed before calling 911, I would have been dead. So, how did it all happen? 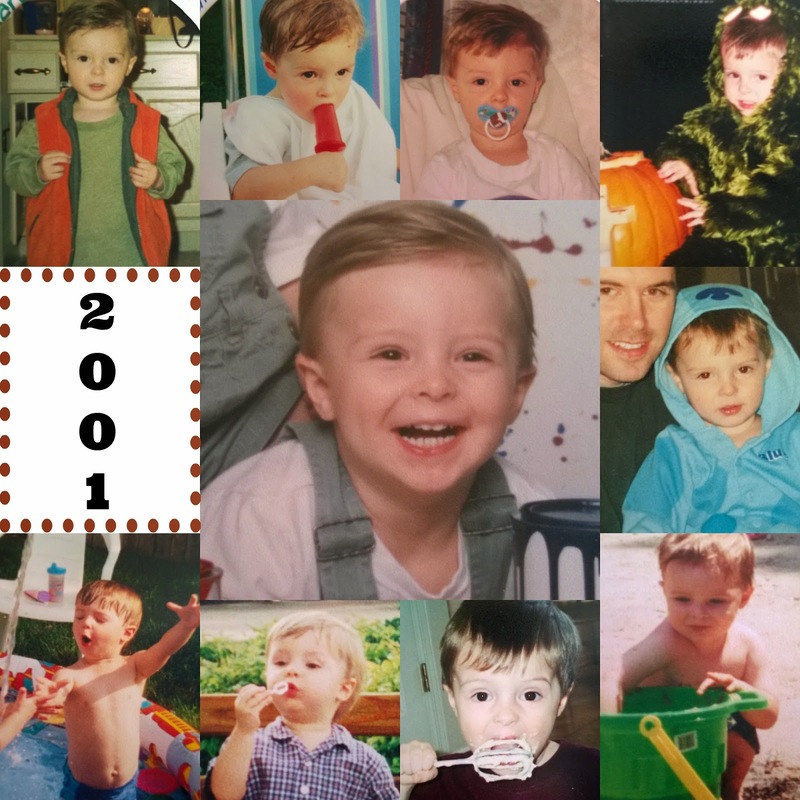 Well, it wasn't an accident that I birthed my baby at home. I'd planned on it from the very beginning, and my husband was supportive of that decision. I found a midwife, faithfully went to all my prenatal checkups, and was all-around excited about having a homebirth. I woke up around 6:15 on August 12, and as I was still laying in bed, I heard and felt my water break. It sounded like a little "pop." The warm gush of fluids confirmed my diagnosis: I was havin' me a baby that day! I was more excited than scared. Oh my, how naïve I was. Once those good, long, hard contractions set in, I wondered why anyone would ever want to give birth. 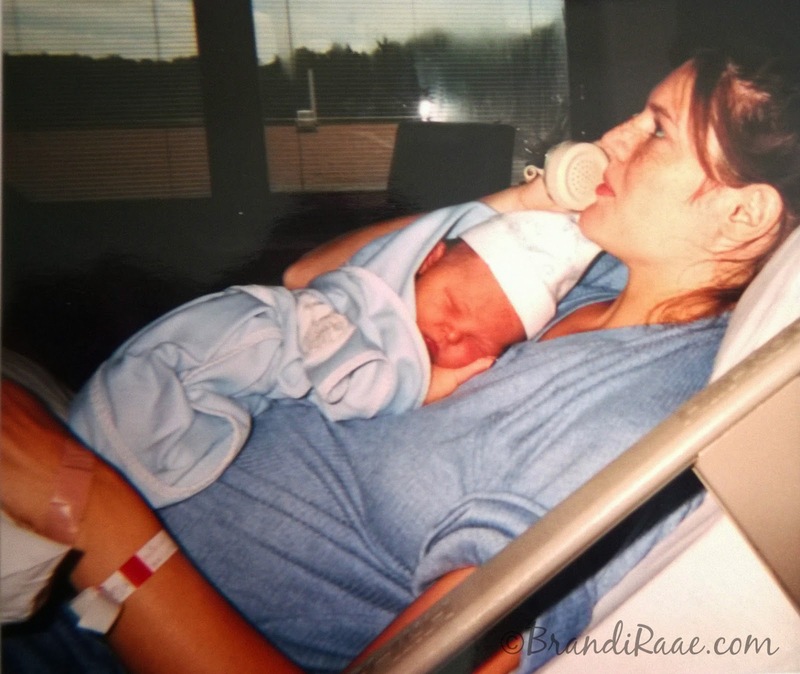 I never threw up once during my first pregnancy, but that all changed during labor. I don't know who ended up cleaning my vomit-soaked wall in my teeny, tiny bathroom, but thank you. That had to have been pretty nasty. After about 8 hours of labor, I felt the urge to push. Little did I know that I would be pushing for 4 hours! Honestly, I didn't know that wasn't normal. Apparently, baby Mullin wouldn't cooperate with the midwife and move his elbow out of the way. He had it propped up by his head, so it sort of made him get stuck. Pushing out a big ole head is hard enough. But an elbow and a head, near impossible. Plus he was a big one - almost 9 lbs. 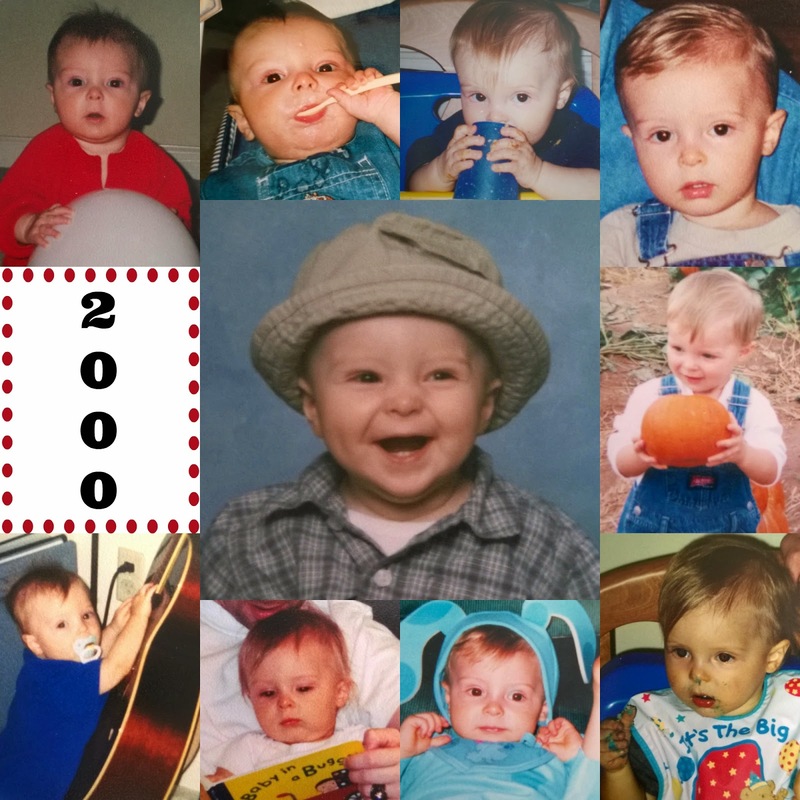 I had no idea the midwife had lost my baby's heartbeat and knew he was in distress. Thank goodness I didn't know, or I might have panicked. All I remember her saying is something like, It's time to push him out. One last big push, you've got to get him out. So, that's what my exhausted body did. One last giant push, and out he came. 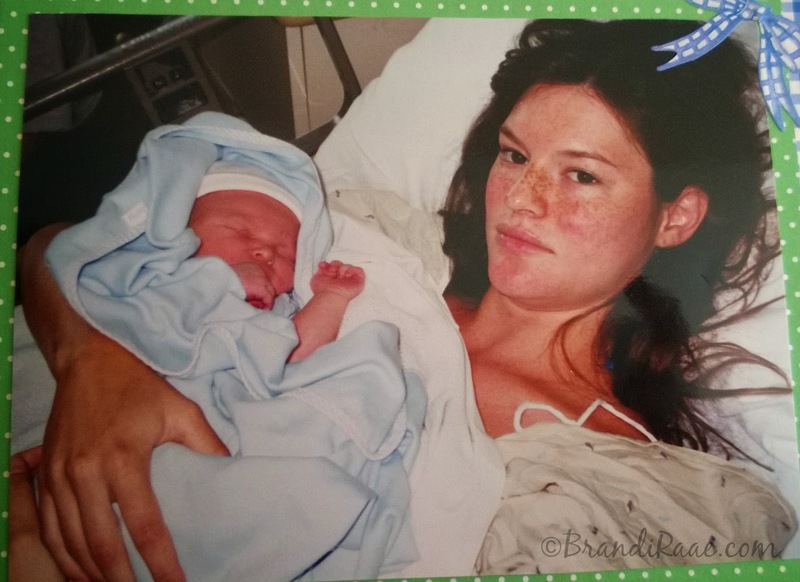 I felt burning and tearing as Mullin entered the world, but it really didn't compare to the pain I'd been going through for the past 12 hours. No one knew yet that my insides had been ripped to shreds. The midwives were focused on getting my blue baby oxygen. I had no idea what was going on. I do remember feeling dazed, but goodness, I figured that's how anyone would feel after the work of pushing a life out. My husband could probably tell the story better from here, because during the time between giving birth and being lifted onto a gurney, my memory is a little foggy. I knew something was probably not quite right when my midwife asked me if I wanted to hold my baby and I said no. It wasn't because I didn't want to. I knew I couldn't. I was extremely dizzy and oh so tired. I guess I was bleeding more than normal. My midwife was giving me some kind of shot to help stop it, but it wouldn't stop. 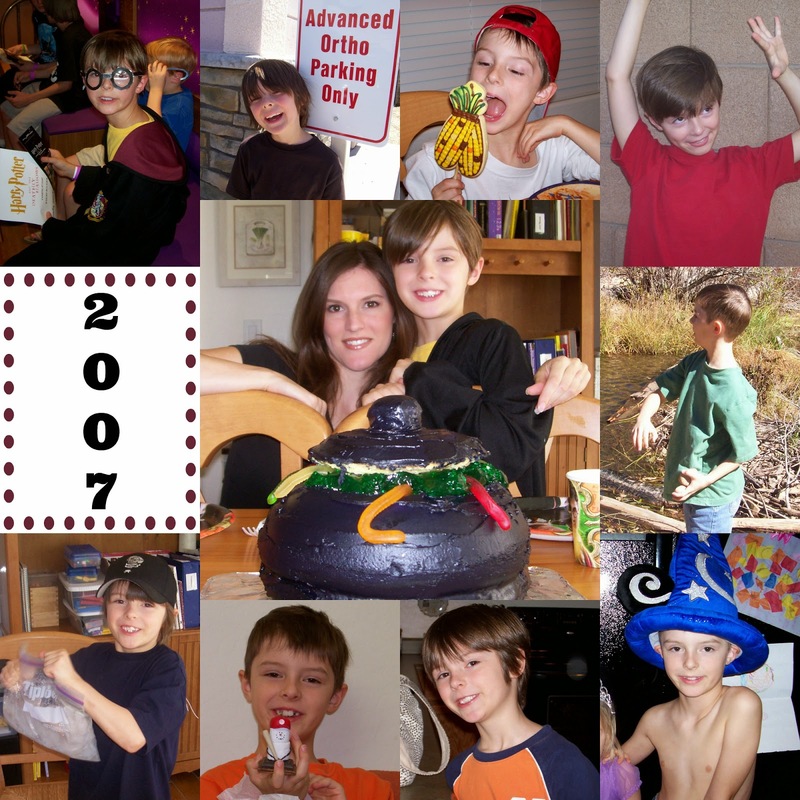 I remember begging my husband and midwife not to call an ambulance. I think my usually calm husband was a wreck at that point. I do know he called my mom, and I think it was after that when he called 911. I have no idea what time it was, but I remember it being dark when I was being loaded into the back of the ambulance. I remember neighbors gathered around in my driveway and asking questions. As we were riding to the hospital, I can remember asking the paramedic if I was going to die because I could see what my heart rate was on some kind of monitor. I think it was 180 or something. He wouldn't answer, he just kept making this weird noise in his throat. After we arrived at the hospital, I don't remember much until I woke up the next morning after surgery and a blood transfusion. The first person I saw was some lady doctor whose first words weren't, "How are you feeling?" or "Glad you're awake." Glaring at me she said something like, You'll never have a normal delivery again. Meaning I'd have to have C-sections if I ever had another baby. Um, okay. Well, thanks for saving my life. I just wanted to know where my baby was. My distraught husband had sent him home with his dad and step mom to take care of him that night. It felt like forever waiting until it was a decent hour for them to bring Mullin back up to the hospital. It was the best feeling ever to finally have my newborn son in my arms. Yes, this is what a face looks like after a near death experience, surgery, and a blood transfusion. Not so pretty. I do remember my hubby saying he'd never been so happy to see my freckles! I guess they'd completely disappeared as my life was slipping away. Too bad the freckles had to come back. This picture was taken the next day a few hours before I was released. 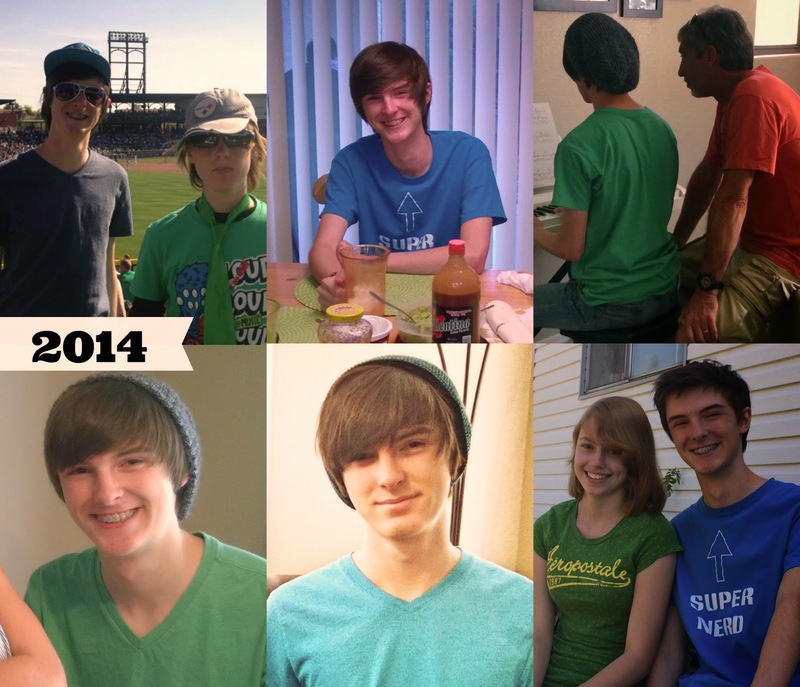 The following weeks of recovery were pretty miserable, but I was happy to be alive. 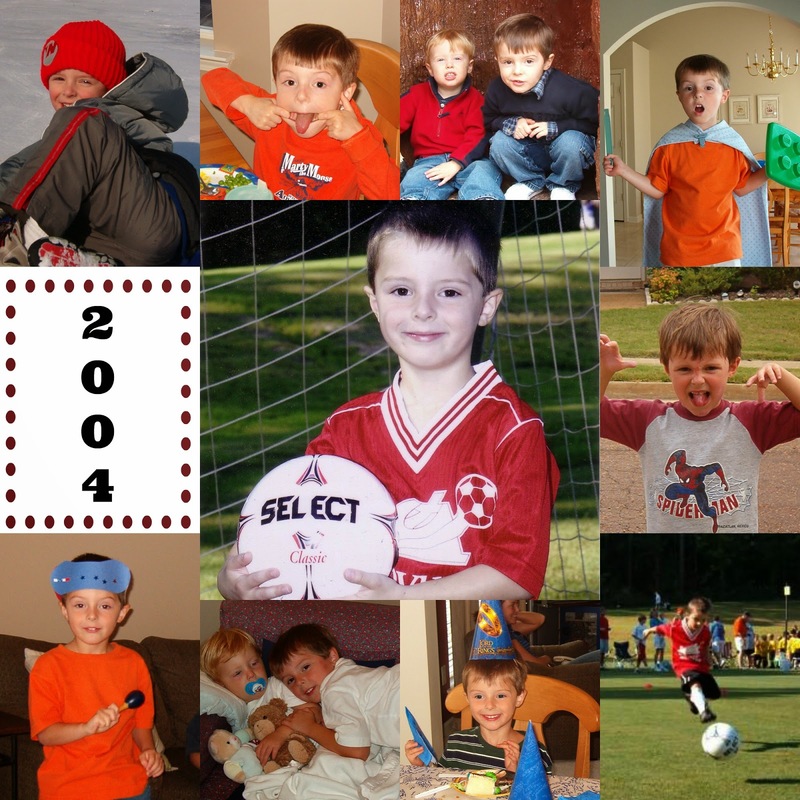 Happiest of birthdays to you, Mullin! 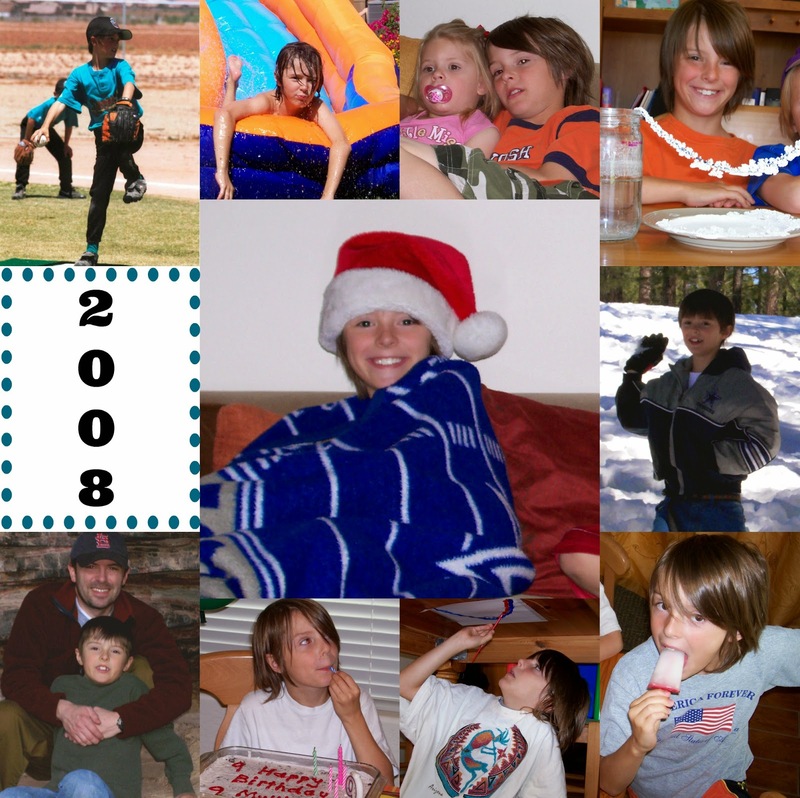 Going through pictures sure brought back a ton of memories. I was even reminded of your goofy side that still surfaces every once and a while. 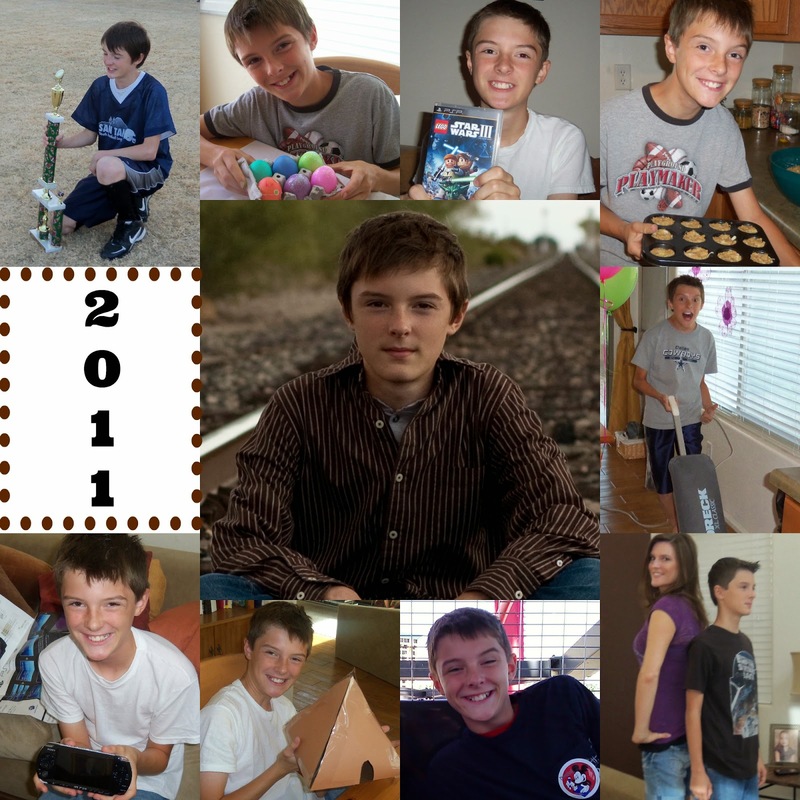 ;) I can't believe how fast the years have flown by. I love you!